Did you know that we, as teachers ask up to two questions every minute? We can ask up to 400 questions in a day and an average of 70,000 questions in a school a year. That works out at about two or three million over the course of our career. But how many get answered? In our busy classroom environments, we as teachers have the habit of waiting less than a second for response and answering many our own questions. Did you know that by following the three second rule for questioning, 60% more children are likely to try and attempt an answer or offer by putting their hand up? In fact, a three second wait time is recommended for lower order questions and up to ten seconds wait time is recommended for higher order questions! Once we adapt our wait time, it is then best to consider the types of questions we ask. Questioning is an integral part of our teaching, thus our questioning should be carefully planned and considered to maximise skill development; regardless of age and class level. One skill that can be really enhanced from the types of questions we ask the children, is inferencing. Basically, an inference is an idea or conclusion that's drawn from evidence and reasoning. Quite simply, an inference is an educated guess. In life we learn about some things by experiencing them first-hand, but we gain other knowledge by inference. So ultimately it is a really important skill to acquire and practice! Inferential questions ask readers to read between the lines. How to practice inferencing skills? Choose an image or a photograph to support inferential questioning. This is a really effective way of creating context for inferential questions. Use the image to get the children carrying out deeper thought, guesswork and to tap into their imagination. What can you tell from the picture that's not shown? I wonder what's happening behind the camera? 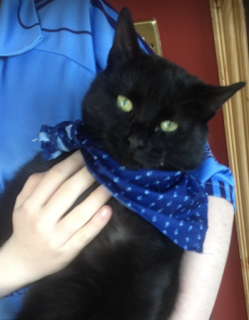 Does the cat like his bandana? Do you think this might be a friendly cat? Why is the cat wearing a bandana? How can I make inferential questioning easy for myself? I always say it, visual cues and prompts are just as important for teachers as they are for your students. We can't be expected to remember everything off the top of our heads. I'm a fan of having different prompts and lists hanging in different areas of the room to remind me to ask certain questions and use particular vocabulary. Enter the packet of post-its! Use post -its to record cues or questions you wish to ask during a reading or visual discussion. Download my 'INFERENTIAL QUESTIONS PROMPT PACK FOR TEACHERS' to support your questioning with all class groups.